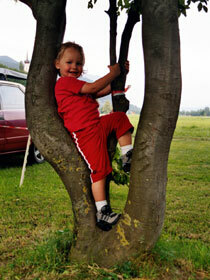 Welcome to our camping site, which is set in the most picturesque scenery the region has to offer. 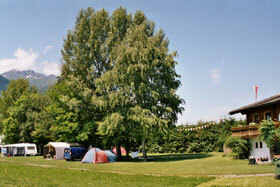 Camping Tiefental is open from May 1 to September 30. During the main season your questions are answered at the reception in German, Dutch/Flemish and English. 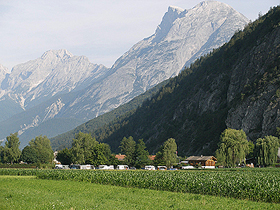 Our camping site is situated in the village of Pettnau, 20 km west of Innsbruck, that is in the very centre of Tirol. You can get to Innsbruck, the capital of Tyrol and twice host city of Olympic Winter Games (1964 and 1976), by car in 15 minutes. You can get to the nearest small town, Telfs, in five minutes by car, but you might as well prefer going by bike on a special bike path — unmolested by car traffic — along the river Inn. 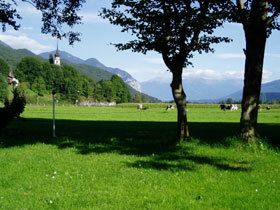 The bus stops to Innsbruck and Telfs are nearby, the train station is only a ten-minute walk through meadows and fields. As our camping site is on the northern edge of the Inn valley, you can enjoy the sun all day long. Our visitors are fascinated by the unobstructed view of our mountains across the green meadows and fields. You have got a breathtaking view of the most wonderful sunrises against the mountains around Innsbruck and the gorgeous sunsets with the rosy evening light reflected from the jagged rock face of the Hohe Munde, the landmark mountain of Telfs — views you will not forget easily. We take great pains to give our family-run camping site a family-like and cheerful atmosphere, where friendliness and quietness are top priorities. You can always approach us, if you have questions, need help, or just feel like having a chat. We have got space for about 20 campers/caravans. There are showers and washing up and laundry facilities with hot water, a coin-washing machine; there are toilets and a sink for your chemical toilets. 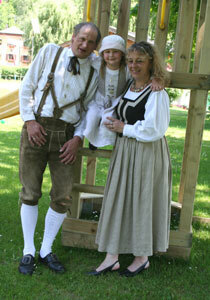 Children are very welcome here and they will enjoy their stay. Close to the camping site — almost within earshot — there are a children’s playground and a sports field. 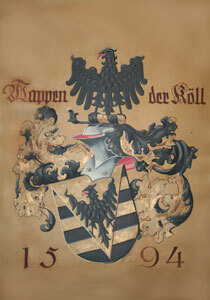 There is also the possibility in Pettnau to go riding. We run a small country inn, in which you are always welcome to have a glass of refreshing beer, a glass of wine or a cup of excellent coffee. Our kitchen offers snacks. 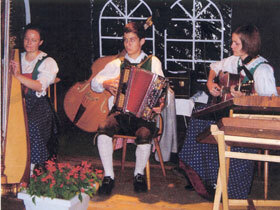 Occasional folk music evenings as well as performances by the local brass band of Pettnau make your stay memorable and introduce you to our typically alpine traditions. The nearest grocery store is within walking distance (5 minutes), you can get fresh trout or delicious freshly smoked trout from a local trout nursery (2 minutes by car). Within five minutes you are in the forest for short or long hiking tours; wonderful bicycle paths start close tothe campsite. On our camping site dogs are allowed, but on the campground and in the village of Pettnau you must keep your pets on a leash. If you plan your stay in the main season, it is advisable to make reservations. We will be most obliged to answer any questions you may have.